Ferrets are cute, playful, furry animals that are often known for their intelligence and clownish antics. They are happy and easy to get into a playful mood but if you think it might be easier to own a ferret instead of a cat or dog, think again. Given their body size and build, activity level, and curious nature, an uneducated first time ferret owner can find themselves exhausted and with a ferret running around the house that they can’t find. 1: They are high maintenance pets and require 2 to 3 hours of play time. 2: They need to be well socialized and given a lot of affection so that they are easy to handle and won’t run and hide. 3: Ferrets nip and can be taught not to, but a scared or abused ferret may bite. 4: Ferrets can live to about 8 yrs but some live longer. 5: They are very playful and need to be stimulated with toys and projects or else they may become bored and destructive. 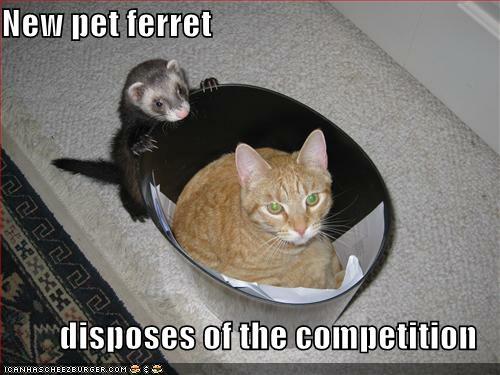 6: The work ferret is derived from the latin word furonem, meaning “thief.” Ferrets will steal anything and hide it. Can’t find your iPhone? Maybe you ferret has it. 7: Some states and countries do not allow people to own ferrets and others require you to have a license. 8: Many ferrets that are adopted in the U.S. are descanted and spayed or neutered. 9: Ferrets have a 50% chance of staying in the same home for their whole lives. This is because they are not easy pets to own and end up at rescue groups or shelters. If you are thinking of getting a ferret, be aware that they will need a cage or enclosure that they can not escape from to hang out in when you’re not home or they aren’t able to be supervised. This keeps them safe as well as keeps some of your house in tact. The cage needs to be big enough to house a water bowl, food bowl, bed, toys, and have enough space or tiers for her to move around, play, and explore. They will also need high quality ferret food which can be purchased at a pet store that carries some exotic pet supplies. Ferrets may play with anything in their cage from a blanket to their water bowl. If you can, find a no spill or no skid water bowl and make sure your ferret has a few toys to play with when you’re not able to interact with her. A blanket or hammock is also a great accessory for your ferret to sleep on. Ferrets need time with you everyday to play, receive affection, and be taken care of. They can be more time consuming than a cat or a dog and can cost just as much with vet visits, food, and toys. Just because they are smaller than many pets does not mean they are cheaper. Ferrets need vaccines and yearly vet checkups like a cat or dog and they also can get illnesses but because they have such a high metabolism, a cold can affect them fast and hard. If you notice your ferret acting lethargic and looking “off” take her to the vet immediately. Ferrets can get catch the flu from us, so be sure to wash your hands and not sneeze on them. Go sneeze on your cat instead or the neighbor’s kid but not your ferret. Ferrets do not like hot, humid, or wet weather. They are dry climate critters so on hot days keep plenty of water available for your ferret and indoors. You don’t want your ferret to be dehydrated, sweaty (yes, they sweat), and cranky. There’s a lot of responsibility in owning any pet, but if you’re not up for the challenges that a ferret will bring to your life, your house, and maybe your sanity, then maybe do some homework and find a pet that fits your lifestyle, energy level, and wallet.